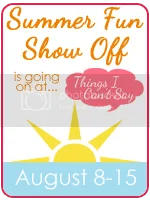 Part of the joy of being a mom is doing the fun summer things with my own kids that I remember doing as a child. When I grew up in Central Illinois, wading and canoeing in the creek was so much fun! My kids experienced wading in a creek during our vacation in Cook Forest, PA. 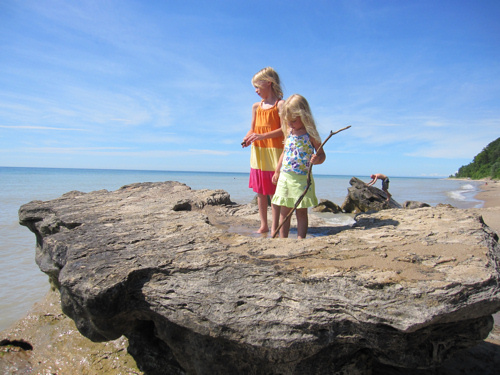 The girls tried to catch tadpoles (key word: tried) and watched water bugs skate along the surface of the water. 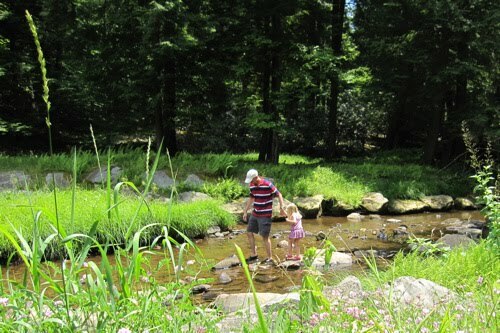 Emmy wading in the “crick” with Daddy. As a kid, we went on vacation every summer with my Dad’s family on one of the Great Lakes. We rented some cabins for years on the shore of Lake Huron, and then we switched to a huge house on Lake Michigan. That vacation is still going strong every year. I love seeing my kids swim with my cousins’ kids. 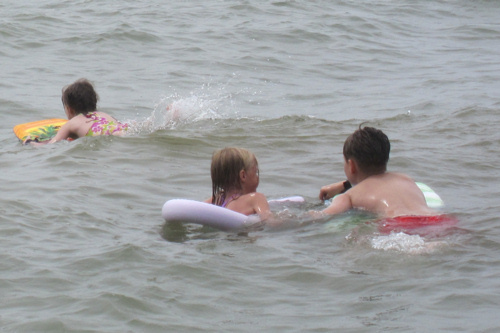 Lily (middle) swims in Lake Michigan with two of my cousin’s kids. 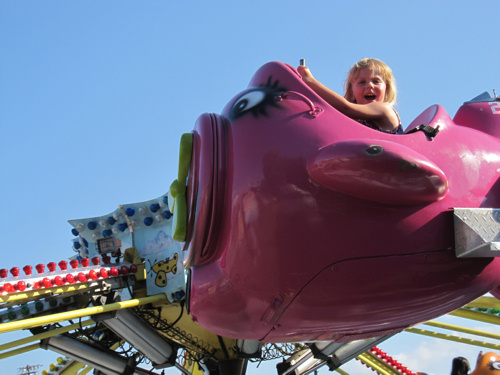 Then there is something my parents never would have let us do during the summer–go to a carnival. 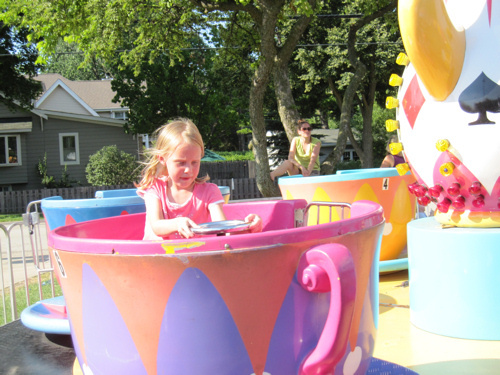 Mom didn’t trust the rides, and Dad didn’t know why anyone would ride them in the first place! Love the pictures and I am happy they got to ride the carnival rides. I grew up going to Michigan, my grandparents had a summer home. My children grew up going to Huntley Lake in Illinois, my dad had a summer home. I love they have the memories. I pray that my grandchildren (someday) will have memories of Mammoth Lakes, CA. It's funny because as a child I loved those carnivals and my parents took us every year, but as an adult, I can't stand them!!!! You are creating such great memories for your daughters! The fun things I do this summer: work mostly. There's a big festival coming up this weekend and I will drive load after load of festival goers with their tents and backpacks to the festival camp site! It will be great! Love that rock climbing pic!I went to Cook's Forest a few times as a kid! Love this post! It made me remember my family summer vacation traditions! I don't have children of my own but I love to watch as my siblings create new, and in some cases better, family vacation traditions with their kids! The rides are fun! Just watch out for the carnies! Great shots! Looks like a fun summer. I have to admit, I don't think I have ever been on a carnival ride, but it looks like fun! This summer, we've tried to go outside the box. As an example, we did Falconry for the first time when we were on vacation in Vermont, and it was REALLY fun! I love the name of your blog – and good job not taking the easy way out like I did, and just posting pictures with practically no words whatsoever. Very cute pics of very cute kids! Beautiful photos. It looks like so much fun. Enjoy the rest of your summer with your gorgeous girls.